Do you love the book (or the movie) The Grinch? 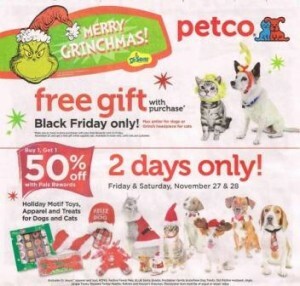 If so, check out these Petco Black Friday Freebies. If you make a purchase at Petco on Black Friday and use a Pals Reward card, your dog or cat gets a Grinch freebie! Your cat can get a Grinch hat, or your dog can get antlers that were inspired by Max from The Grinch. Be sure to check out all the Petco Black Friday deals!